Of all the visions and messages that God gave Isaiah, this passage contains the most famous. It is in this passage that Isaiah describes the coming Messiah, here called the Suffering Servant. Isaiah foretells in great detail the kind of suffering that the Servant would have to go through and the kind of death that he would die. He describes the lowly and non glorious life that he would live, which was contrary to what many people believed the Messiah would be like. Isaiah goes on from this description to explain the nature of the redemptive work of the Servant that is available for anyone who will just believe in Him. It is a free gift that needs no money and has no cost. This is the greatest and most important message that Isaiah receives from God. 1. Show the children the picture of Jesus on the cross before you begin story time. Ask the kids who this is. (They will of course answer Jesus.) Tell the kids that today it is easy for us to recognize this as Jesus, but before Jesus came to earth, people did not know what he was going to be like. 2. Explain to the children that Isaiah wrote down a very good description of what Jesus would be like when he came to earth. Instruct the children to look very closely at the picture as you read the passage to see if they can find some of the ways that Isaiah described Jesus. 4. After the passage has been read, ask the children what they remembered from Isaiah’s description that they can see in the picture. This passage is one of the most accurate descriptions of Jesus in all the Old Testament. It says that Jesus would not be popular (53:2), and he was not. It said that he would be rejected by men (53:3), and he was rejected, by his own home town! (Mark 6:4) Isaiah even described the kind of death that Jesus would face (53:5), death on a cross (John 19:16-18). Isaiah 53:12 also describes the type of redemptive work that Jesus would do, saving people from their sins. (Romans 6:23) Nowhere else in all of the Old Testament does God so clearly reveal to us His Son, Jesus! 1. Gather all the kids at one end of the class room. Have everyone get down on their hands and knees. Place one book/magazine on the back of each child. 2. When you say go, have the kids crawl on their hands and knees to the other side of the room without dropping their burdens. If anyone drops their burden, they are out of the game. 3. Line up the remaining kids and add another book/magazine to their back, increasing their burdens. Continue in this manner until you have one kid left who has carried the heaviest load. 4. Explain to the children that Jesus carried the burden of all the sin in the whole world when he died on the cross. • Place one piece of tape over one end of the toilet paper tube. This will now be the back side of the sheep. 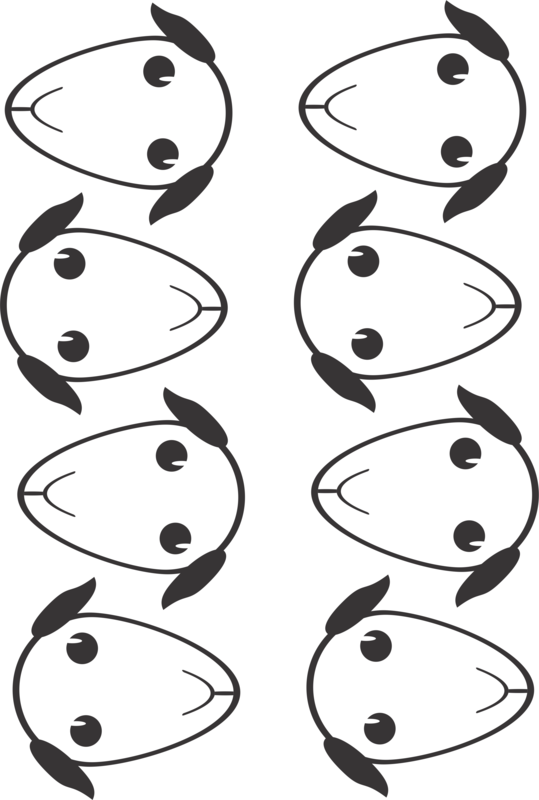 • Cut out the sheep head template. Glue the head to the cotton balls on the open end of the tube. • Cut 4 small segments of pipe cleaners. Turn the sheep over and glue each of the pipe cleaners into the cotton balls to make legs for the sheep. Allow the sheep time to dry. 1. Read Isaiah 53:2 to the children. Explain how Jesus is referred to in this verse as a tender shoot or plant coming up out of dry ground. As your kids are completing the craft, talk to them about how Jesus cam as a root out of a spiritually dry people. 2. Have the kids write their names on a plastic zip lock bag. 3. Give everyone a paper towel to fold into quarters. Make the paper towel wet, being sure to squeeze out most of the excess water. Place the wet paper towel inside the plastic bag. 4. Have the kids place several seeds on the wet paper towel. Seal the bag, pressing out the air. Do not place in direct sunlight. Vou usar em meu encontro com as crianças, que bom ter encontrado você..Deus te abençoe!